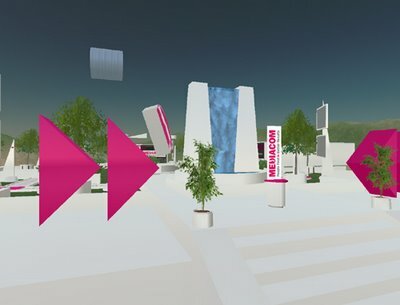 A new arrival to Second Life is Mediacom, a global media buying and planning company with over $13 billion in billing and has over 100 offices in 80 countries worldwide. 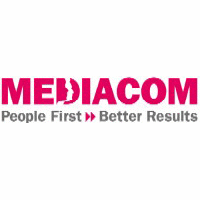 It is one of the many Real Life branding companies making a move towards Second Life, and in this case, Mediacom is a player. The question is: "Do they understand how the game is played?" I'm not sure they do. 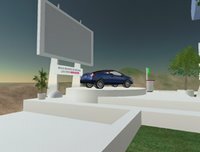 First of all, the sim is still in development mode (I'm guessing, since it's half empty). For bloggers like me its always nice to have sneak previews, but I'd rather see a complete build than a half finished one. In my opinion the island is open too soon. The main venue is a square with a lot of basic white. The coloring does fith the corporate colors, so no remark there, it's just my fear of German Design Snowblindness is playing up again. The main venue is set up in a square with a white path leading past the various stages. The path includes the location of all offices. 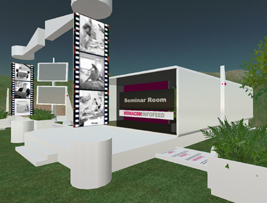 There's a seminar room, an inforoom and some display stands. Peculiar is the slogan behind the car (right) reading: "Building Brands in Second Life." If they live up to that call, time will tell.